Our new Showroom, Office and stores is now open. Come and visit us in our new premises, where we can offer support, advise and help, with any purchasing or hire needs. Our service and repair team are always on hand for any repair and servicing requirements, as well as offering advice and guidance on the telephone. Any parts for your Avant and attachments can be purchased through us. 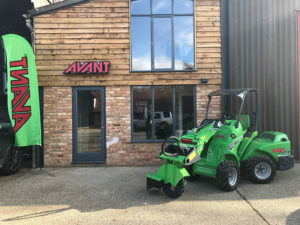 Come and visit us, where you can see and try out our Machines and attachments in our new Demo area! Our customers are already seeing the benefits from being able to use and test the Avant Loaders, before they hire or purchase.